Tony De Nonno, It’s One Family – Knock on Wood. 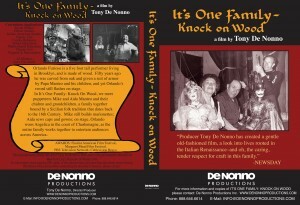 A 24 minute DVD on the Manteo family of puppeteers in New York City available through WWW.DENONNOPRODINC.COM. For more information on the early years of the Manteo family puppet theater, see Jo Ann Cavallo, “Agrippino Manteo” (Literary Encyclopedia at www.litencyc.com). Il puparo Franco Cuticchio figlio d’arte (2016). A new documentary on Franco Cuticchio by Ines Manca soon to be available. See also Casting the Apprentice from John Turturro’s Prove per una tragedia siciliana / Rehearsal for a Sicilian Tragedy (2009). Young Sicilians relate to Turturro the stories of Orlando’s love for Angelica and his madness after her marriage to Medoro, commenting also on how they visualize Orlando and Angelica. Mimmo Cuticchio shows Turturro how to perform some moments from the scene of Orlando’s madness. Includes brief clips from puppet theater.